Everyone who comes to this page is a reader. Bloggers love to read as well as write: poems, flash-fiction, memoir, novel excerpts, reportage, long pieces, short pieces; it’s how the blogweb works: exchanges to entertain, enchant, enthuse, encourage and elucidate. Some of my stalwart followers and followees boldly read and create in second and third languages, which for me who only has proficiency in English is a great source of admiration and envy. And if that’s not enough ‘Es’ already, I have some more. But first a question: what about those (old and young) who find reading a struggle? What about those who find a page loaded with text a total turn-off, or the average sized paperback too daunting in scale to broach? And to answer my own questions, this is where the book cover below comes in, because one of the things I do besides loitering in cyberspace is to write good stories for unkeen teen readers, (or for anyone else I can corner for that matter). Cover: copyright 2013 Ransom Publishing. The title of this new edition of my very short book Mantrap clearly begins with ‘M’ ( which means you can look forward to more mentions further down Frizz’s alphabet.) So what is it doing here now? 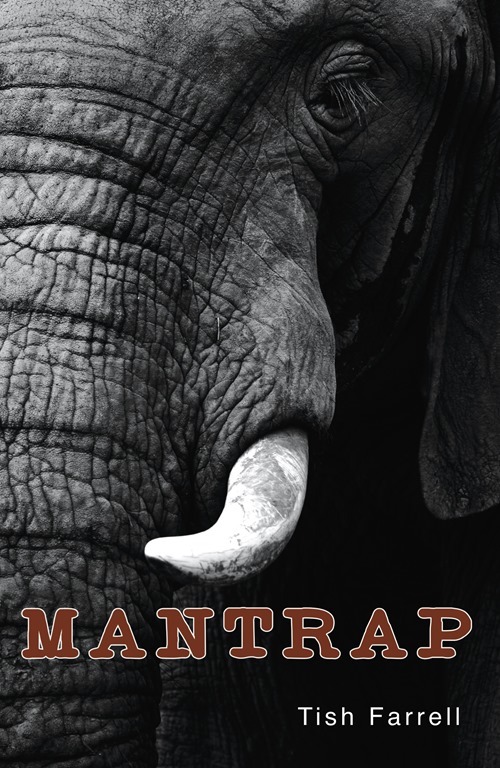 The elephant is of course the excuse I needed to write this piece, also the fact that Ransom Publishing will shortly be bringing out an e-book version for Amazon Kindle and Apple, as well as a paperback edition. It is part of their Shades series. Full details of this and other books in the series can be found HERE. The series is being printed as I write this and will be launched in August. Interest-wise, the stories are aimed at readers of twelve years and upwards, but whose reading ability is deemed to be a few years younger. The text is a piece of short fiction but presented in a novel format i.e. 6,000 words divided into several chapters, and over 64 pages. There is plenty of white space on the page. Ransom publishes a wide range of fiction and non-fiction for all ages. Personally, I think the Shades’ quick-read formats are ideal for just about anyone who wants a good story, but has limited time to read it. You can slip these nice little books into your pocket. However, this is not so much a sales pitch as an explanation: the why, where and how this story about ivory poaching came into being. There’ll be an excerpt at the end. The fact that it was in leaf at the time was perhaps auspicious. 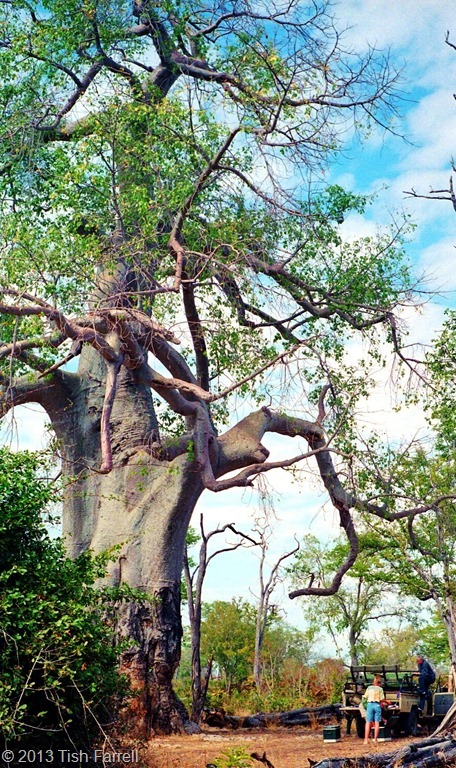 Baobabs are usually bare. This one could be a thousand years old. We stopped under it for a noonday picnic after a get-up-while-still-asleep and go on a dawn game drive. 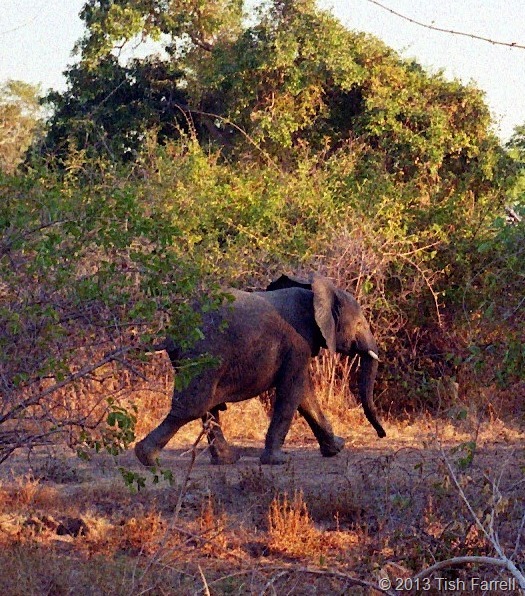 The location is South Luangwa National Park in Zambia. 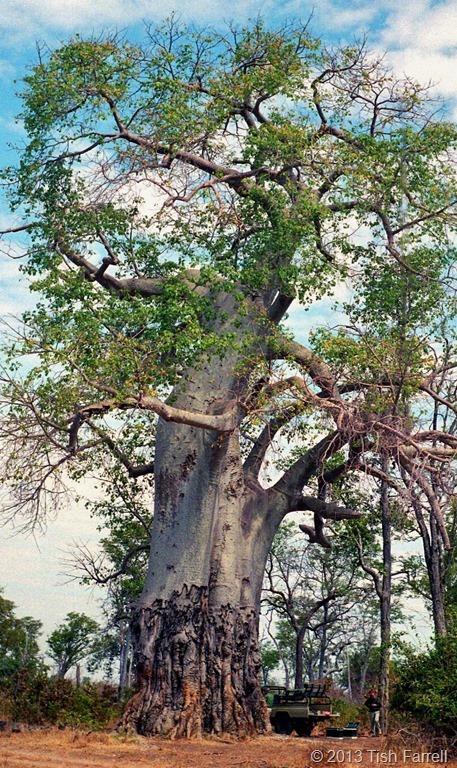 It is a glorious place with parkland vistas, much shaped by the local elephants who knock down the thorn trees, but rarely the baobabs, to encourage the growth of their favourite food – grass. 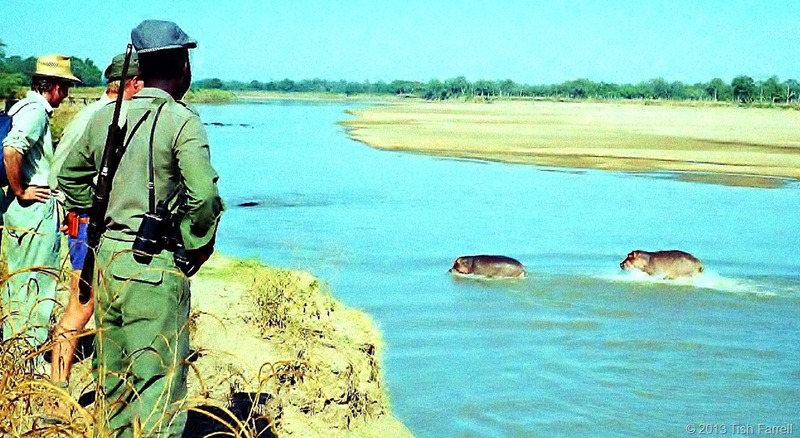 The other great shaper of the territory is the mighty Luangwa River as it endlessly carves new meanders through the bush country. As the river shapes a new channel, so the old meanders are left behind, some becoming stagnant lagoons where hippos wallow amongst the cabbage weed. The local people call such places Luangwa waffa or Dead Luangwa. But back to Mantrap. It was while I was standing under the baobab, and peeling a very English hard-boiled egg, that our guide happened to point out the narrow strips of wood that had been driven unobtrusively into the tree’s hard, smooth trunk. “It’s a poachers’ ladder,” the guide told me. “Ivory poachers. This tree has been a look-out post for years.” He went on to tell me how earlier that week an elephant had been killed nearby. The tusks had been taken, but then later, when the coast was clear of poachers, the local villagers had come to grab the meat. My spine tingled: horror and pity, and not only for the elephant. I knew that rural Zambians were in a poor state. This was the reason why we had come to Zambia. Team Leader Graham was responsible for the logistics of delivering EU food aid to drought-stricken villagers. (See Letters from Lusaka.) Also, elephants and other game can destroy a farmer’s whole crop in a single night. The conservation of wild game, then, and the protection of neighbouring people’s livelihoods are matters not easily resolved. Game parks across Africa generally do not have fences. Animals move about at will, and many farmers are maimed or killed by buffalo, crocodiles, hyenas and elephants. Their families rarely receive compensation. We, however, belonged to the fortunate segment of the world’s population that had no shortage of food and also the leisure to take a few days holiday, staying in a small tented camp run by Robin Pope Safaris. On the way to our campsite from Mufuwe airstrip we crossed a dried up river where a girl was digging deep into the sandy bed in hopes of scooping out some water. In the gardens of a nearby farmstead, the maize was blown to dust. It was hardly surprising that there was a poaching problem in the district. People were starving. But then to my mind, there’s a big difference between hunting antelope and small game for the pot, and particularly when the park and surrounding licensed hunting blocks occupy the local people’s former hunting territory, and the obscene and pointless slaughter of elephants solely for their ivory. Yet the temptation to some locals must be enormous. They have families to support, children to send to school, medicine to buy. Big business cartels, especially in the Far East, are apparently more than glad to arm and fund local hunters in the pursuit of ivory and rhino horn. This means that park rangers are at great peril. Many are murdered in their attempts to protect wildlife so tourists like us may come and stare, and snap away. One way to combat poaching is to give people good reasons to protect the game. Robin Pope’s Safaris have pioneered schemes to involve local communities in conservation. So these, then, were some of the things I wanted to explore in my story. What emerged was a life-and-death adventure that had its beginning the moment my fingers touched the rungs of the poachers’ ladder. Here then is an excerpt – the opening scene. It is dawn in Luangwa. Hunger has finally driven Danny and his father, Jacob, into the National Park to hunt antelope. But Danny is a schoolboy, not a hunter; it is not surprising that, in his panic, he makes a mistake – a mistake that lands them in the clutches of a corrupt ranger who has a far more dangerous quarry in mind. “Impala. A small herd among the sausage trees. Jacob stopped dead and held up a warning hand. Danny froze on the spot and this time, without a sound, dropped behind a potato bush. He peered through the leaves, fixing on a big ram. He was about twenty paces away, grazing the yellow grasses, his harem of females all round. Danny’s eyes stung with longing. There was that beautiful ram. So near, and yet so far. The smallest sound might send him bolting. Out of reach! And finally, here’s a short clip that shows Luangwa in all its rain-soaked glory. One of the earth’s most beautiful places, and over four hundred species of birds. 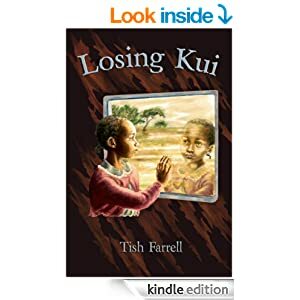 Posted on July 30, 2013 July 30, 2013 by Tish Farrell	This entry was posted in DP Writing Challenge, e-publishing, Fiction, photography, Tourism and tagged ivory poaching, Kindle, literacy, Mantrap, quick reads, Ransom Publishing, reluctant readers, Tish Farrell, wplongform, Zambia. Bookmark the permalink. what a great post, and baobabs are my favourite trees. Thanks, Joan. It’s hard not to love a baobab tree, isn’t it, curious as they look. They’re so useful too. I keep thinking I will do a post just on baobabs. yes, i have written about them also, when we went to Mana Pools in March this year. They were also in leaf then, so not as dramatic looking! Great post, Tish, a lot of work went into this. Thank you so much shaing! Well thank you for reading it, Dina. Fine photos and story. I didn’t know baobobs were so large. What a good-looking book cover! Thanks so much for your comments, Bumba. Yes, baobabs, are amazing. Some grow incredibly wide – as big as a house, and I think the ones on Madagascar grow really tall. They live for at least a couple of thousand years, and as they die their fibrous middles hold water like a water tower. Elephants of course know things like this. I’d love to visit Madagascar someday, as well as all these places in Africa. This has been a beautiful read, and I’m sure that your story will attract many young people, and introduce them to the joys of reading. It is wonderful to read of such a project, where you’ve offered so much on so many different levels. If the book was in Hebrew, I would buy it immediately for my own grandchildren. Thank you for your very encouraging comments, Shimon. I have to say, that as writer trying to enthuse unkeen teen readers, one has to travel hopefully in every sense – hope that you’ll manage it, and hope that they will build on the experience. As to translations that’s an interesting thought. UK educational publishers tend to struggle, and so are generally keen to license works to foreign publishers. So you just never know. What a fascinating story this post is! Although I’m not your target audience demographic, I’m looking forward to reading your new book, myself. Also, thanks for bringing the video to my attention. You were right – the birds are striking, and I also was enraptured by the scenes of the elephant families. Thanks for posting. You’re more than welcome, Babsje. Oh my! We have been, it seems, in the same place. I can never forget my experiences in South Luangwa National Park, my first (of many to follow) encounter with wild Africa while living there for many years. I look forward to reading this book! Thanks so much for your comments. 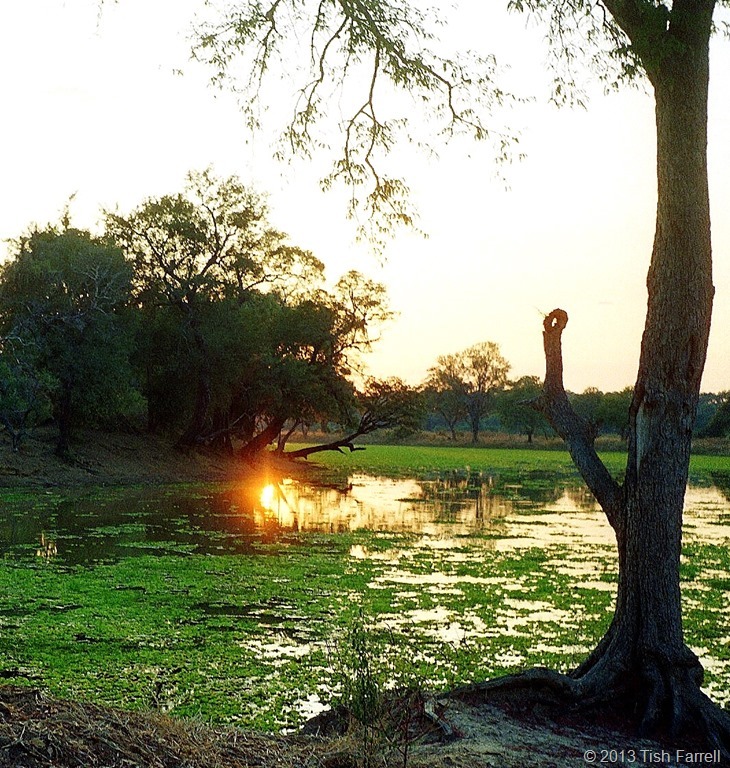 Luangwa is a magical place isn’t it? Sparse in other tourists when we were there. The Zambians seem to have been keeping it that way by staying upmarket. What a wonderful post! And a great idea to do stories for struggling readers. Now a lousy 16-year-old reader doesn’t have to read about subjects they are totally disinterested in. Congrats on being published and love the story! Thanks so your lovely comments, Tina. Much appreciated. As a writer one has to ‘travel hopefully’ to enthuse kids who, for whatever reason, are wary of picking up a book. It’s no good telling them that they’re missing a lot! Hello Tish, loved the photos and the video was fantastic. But my query. Are sausage trees, boabs? We are spending a few nights next month at a camp called ‘sausage tree’. Always thought it an interesting name for Africa and now it turns up in your book…and you have lived in Africa? Lovely comments, Woolly. In answer to your questions, Sausage Trees are different from baobabs (nowhere near so big or elderly), but they have similar (if rather longer) big seed pods. As trees, they are rather more attractive than baobabs. Thanks Tish. Looks like I have something to look forward to then. Thought Sausage Tree was just a name,until I read your post. Thank you very much, gp. Dammit, I wish I could write like this. I’ll be honest, I have always struggled to be objective about other authors and try to avoid being judgmental. One – can’t like everything, right? For me, however, a large part of what makes a good writer is someone who can captivate a reader who would otherwise have zero to limited interest in the subject matter. Pretty much everything of yours I have read has done this. I know I’ve always read your posts to the very end. You truly deserve every success, Tish. You are nice, Ark. A great morale booster. Thank you for being my most diligent reader and commenter. You know, too, it’s all about keeping on keeping on. So I reciprocate your best wishes for every success. Besides which, you write really well too. How well my writing turns out has a lot to do with how enthusiastic I’m feeling about the subject. I struggle for words a lot of the time; it means I write fewer than I used to. I think this is possibly the key. Also I have long toiled away writing scripts for picture books (and to no avail yet), but doing that ingrains into brain the directive to make every word count. Thanks again. Yes. It’s great advice, though not always easy to effect. We writers do so cling to our lovely words.